You may express your interest in any number of our ministry opportunities simply by going to the "I want to learn more" page. Fill out the brief form and someone from the ministries you have selected will contact you to answer any of your questions. The West Houston Assistance Ministry is a multi-denominational agency serving over 16,000 West Houstonians. They do this through their food pantry; which is restocked by placing food in the large box in the narthex; resale shop, which thrives on community donations, such as your hand-me-down clothing, extra home goods, and furniture you no longer need; and client services which is oriented to increasing individual self-sufficiency. Ascension Episcopal Church is one of many sponsoring churches for WHAM and nominates two persons to the governing Board of Directors. These Board members help guide the mission and vision of WHAM. There are three ways in which you can support WHAM: the giving of food for their pantries; the giving of your time as you volunteer to help sort clothing; and financial donations to assist others in need. If you would like to assist, please give them a call to schedule a shift. 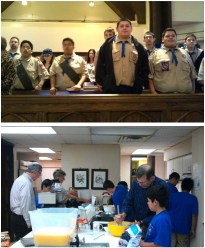 Boy Scouts: The Ascension Episcopal Church chartered Boy Scout Troop 1836 (“The Texas Troop”) who meet each Monday at 7:00 pm in the parish hall. The members of the troop are boys 10 to 18 with adult supervision of Scoutmasters and Assistant Scoutmasters. Check their facebook page. Cub Scouts: meet here during the week as well in the Junior High room, second floor on Tuesdays.